When Amara Norman talks about her parents, Davita "Cookie" and Merritt Yoelin z"l, she lights up. "I was so blessed," she says. 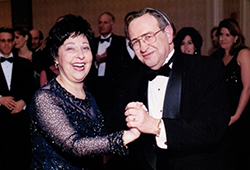 "Mom was my best friend and if not for Dad's encouragement, I might not have become involved in the Jewish community, especially with PJA, which I love." Portland's Jewish community meant the world to Cookie and Merritt who were married for more than 30 years at the time of Cookie's passing in 1999. When he passed away in 2012, Merritt was a senior partner at the law firm Samuels Yoelin Kantor LLP. During his life, he served on boards and committees of multiple Jewish organizations including OJCF's Board of Directors, as Treasurer for Jewish Federation of Greater Portland and as President of both Congregation Neveh Shalom and Jewish Family & Child Service. Partner Steve Kantor says that Merritt was "never afraid to inspire his Jewish clients to make gifts to the Jewish community." Cookie was also very involved with Congregation Neveh Shalom and helped found the National Council of Jewish Women's (NCJW) Young Women Portland Chapter's Division and Lions Group. Near the High Holidays she could be found creating beautiful flower arrangements for Neveh Shalom's services. "Mom was such a welcoming person," says son Adam Yoelin. "Whenever there was a new congregant, she was always right there to introduce them to everyone and encourage them to become involved." Adam remembers his mother as "strong, independent and extremely smart  together, she and Dad made an incredible team." The Foundation is tremendously honored that Merritt chose OJCF to establish his legacy and continue helping others. "The desire to be deeply involved in the Jewish community and to help others get involved was ingrained in them," says Amara. "All they ever wanted was to make things beautiful and to help good people give back. And it was because of their love  for each other and for our community  that they sparkled."